Traveloscopy Travelblog: Is this the world's smallest castle? Is this the world's smallest castle? HOW SMALL IS MY CASTLE? But near Long Compton village in England's Cotswolds a couple of hours out of London, is an officially recognised castle that rather than being famed for its vastness, is renowned instead for just how small it is. 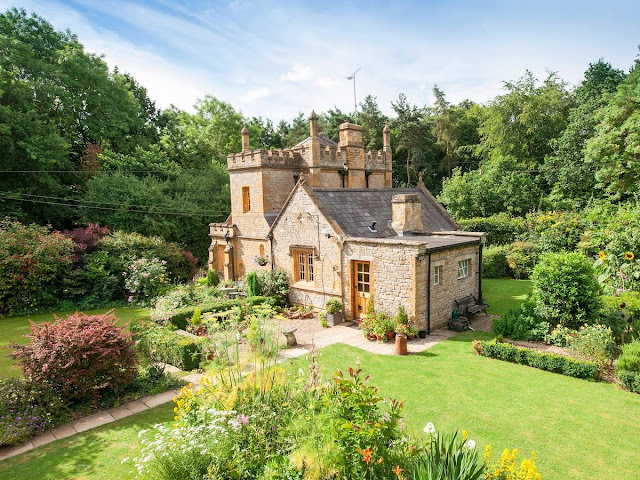 Because with a floor area of a mere 73 square metres it is England's smallest castle, and actually more tiny than many of its neighbouring country bungalows and cottages. And although it is called a castle, and recognised by many official authorities as a castle, to most locals it is known simply as Molly's Lodge, and comes with just one bedroom, a modest living room and dining room, compact kitchen and a little bathroom – and despite its moniker as a castle, served for a time as gatehouse to the opulent once deer-hunting property, Weston Park Estate. But importantly it's still officially a castle as far as the British government is concerned, because it has corner turrets, mullion windows (fashionable in Romanesque architecture,) and a crenelated parapet from which arrows could be unleashed in days of yore at anyone foolish enough to try to attack. TINY as it is, because of its design this is still recognised as a castle… and officially England's smallest, with a floor area of just 73 square metres.